Initially I didn't plan on getting the hardcover series Timeless Tales as I already got all the monthly issues the books collects and some of the trade paperbacks as well. But when ordering some other books I saw a sale on the first volumes, and well… I couldn't resist a good deal. Compared to the monthly issues and the trades the books print the comics in the same size as the monthlies, while the trades have a slightly smaller print. The monthlies and the trades use a glossy paper type while the books have a thicker matte paper. The colors are a little bit brighter on the glossy paper. The books each collect six issues of the monthly comic titles, and have the same content as two trades. I'm sure the various serials in the monthly comics are planed so books can collect six issues without having to break up a serial. But the books won't always collect exactly two trade paperbacks. Ex. the Scrooge's Last Adventure trade collect 4 issues (US #13-16), while the next trade Himalayan Hideout will have the usual 3 issues again (US #17-19). So Uncle Scrooge: Timeless Tales vol.3 with 6 issues (US #13-18) will only collect part of the second trade. In addition all books have one extra bonus story not present in the comics they collect and they also have a new introduction article. But that's not the best thing about these books. This information was new to me until I started flipping through the books, but might be important to some. While some of the stories in the monthlies and the trades are censored, the books actually print the stories how they originally were drawn without the censoring. In the story with Shamrock Bones that I thought was censored in a really silly way, the good guys are now allowed to use guns again. This story was also censored in the trade paperback. The Ghost of Man-Eater Mountain had splash panels and several other panels removed when printed in IDW's Mickey Mouse #5. In Timeless Tales all original content is present in the story. But in this case, the uncut version is actually used in the trade paperback too. And Grandpa Beagle is allowed to smoke his pipe again. I haven't done any extensive comparisons of the different editions, but for most part the censoring seems to be gone in Timeless Tales. One exception is the story Hampered! from the British Mickey Mouse Annual that is censored in all American prints. But that one was censored for good reasons! So if you haven't got any of IDW's Disney comics yet, Timeless Tales is the definitive edition and the one to get. Hex, I should note that all the stories in Donald Timeless Tales Vol 1—not just "Hampered"—are still edited as in the monthly issues. For various reasons, we had to rush that volume through production at extra speed, so there was no time to prep less-edited versions of the material. Yes, the tiny border around the comics is a problem with the trade paperbacks – sometimes you have to make pressure to the spine just to be able to read the text that is close to it. It's a bit hard to describe the quality of the comics with words, but most of my copies also have white marks (not rifts or stress marks) on the spine that is a result of the stiff paper type IDW comics use and the folding pressing done at the factory. I think most comics from IDW are like that. I like to take good care of my comics too, but I'm not too concerned about details like that. As my local comic shop usually just take in the one copy I order that's what I'm stuck with. I don't have the luxury of picking the best copy like you can do in some of the larger American comic shops. But I got to get some ranting out of the system while I'm on the topic. If you are a collector caring about the condition of your books and trades – stay far away from Amazon! Almost all of my books bought on Amazon have one or more corner bumped in because of poor packaging. In the case of the Timeless Tales, I got the books together with two other books in the same package, and they were all thrown into a way too large box together with some air-filled plastic that had no purpose at all in that box. So the books had been bumping around inside during transport and all five books had small damages upon arrival. The Mickey-book was the worst with part of the spine cracked. And it's far from the first time this has happened. A couple of months ago when I got the great Silly Symphony companion by J.B Kaufman, the front cover was almost completely ripped apart from the spine and the dust jacket was ripped too. For foreign buyers returning something to Amazon is not a good option as the return postage often is 3 times the max postage Amazon is willing to refund. But in the case of the Silly Symphonies book I actually got a full refund on the book, so I'm happy with the customer support on that. But that doesn't change the fact that they generally have the worst packaging I've seen in the business. Well I am from Croatia and everyone I know that orders hard covers comics orders from bookdepository.com. I buy Barks, Rosa and Gottfredson from them and all the single books I got are in great condition, of course there is always one corner slightly bumped but that is why I get everything in boxsets, they are all mint and never opened. I only buy Barks single books because most of them will get a boxset years later down the line and I cant wait for that. 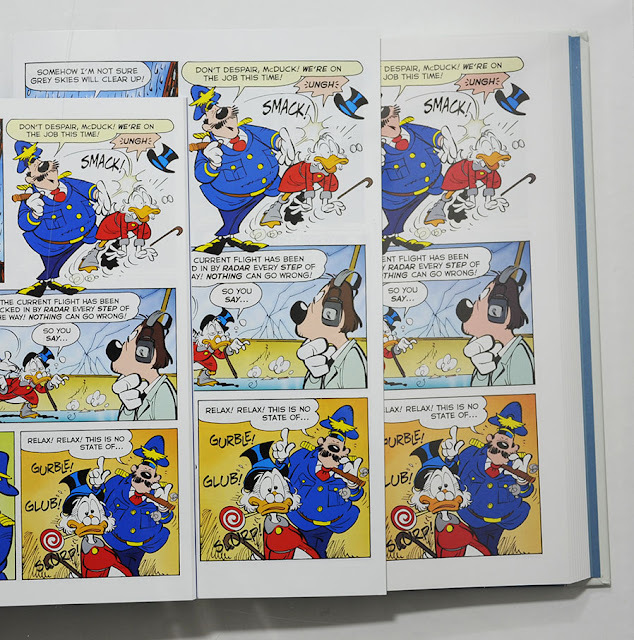 As I said both of my Donald Duck dailies books are damaged with very crushed corners and big white tears so I dont feel like buying any more but it is a bunch of very similar gags so I dont think I will be missing much. But it is a shame because the books are really beautifully produced. I order monthlies off three or four biggest uk shops on ebay.co.uk and they all come in regular cardboard envelope absolutely perfect as near mint as it gets, not counting those tiny factory defects. Such fragile little books in so much better shape than big hard covers, its silly really. Reason I started collecting monthlies is I wanted more Mickey stories, Gottfredson is great but its not enough with such abundance of duck comics available. My favorite is Casty, I wish some day they reprint his stuff from Boom era of wdcs, there were some great epics there but these are so scarce, its easier to find a gold nugget then collect all of them. I also really liked the Salvador Dali story, they should do more stories like that, with that abstract old school character design and everything. I hope they publish Epic Mickey the graphic novel somewhere along the line plus two short stories that go with it, it could fit two issues of wdcs. Some great stuff there. Also I would like to add, latest Gottfredson boxseT I ordered got opened somewhere during transit and it actually came to me opened and books were really damaged and book depository sent me a replacement copy which came well protected with bubble wrap and everything and told me to keep the damaged copies, so those guys are ok.
Is it my imagination or do the timeless tales books seems blurry compared to the other two? I understand that and I don't mind the muted colors but the line work appears blurred. It that the case in the actual book or is that from the photo? I guess it's the photos that make it look a bit blurry. 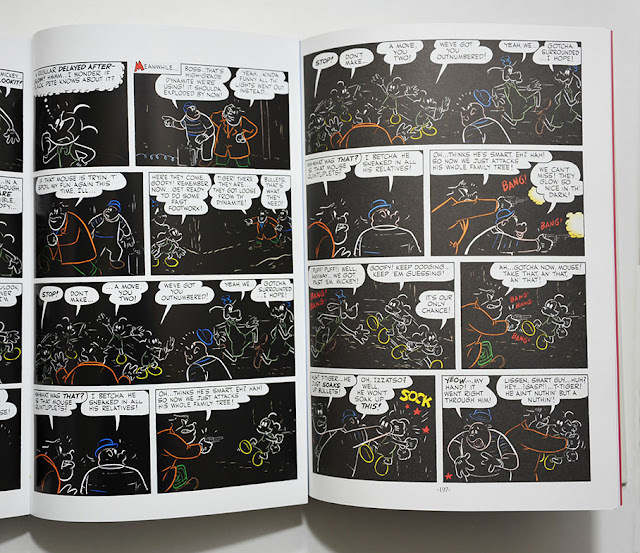 It's a different kind of paper in the hardcovers so you can see a difference in the colors. But the black lines are just as sharp as in the other two. One more question, are there any plans for Wald Disney Comics & Stories Timeless Tales volumes or are we stuck with the soft covers?